I wrote this on my blog last winter. I have adapted it to become the epilogue of my walking stories through the Netherlands and Germany last year. The title will be “Solid Ground”. You can download it from this site around the end of June. 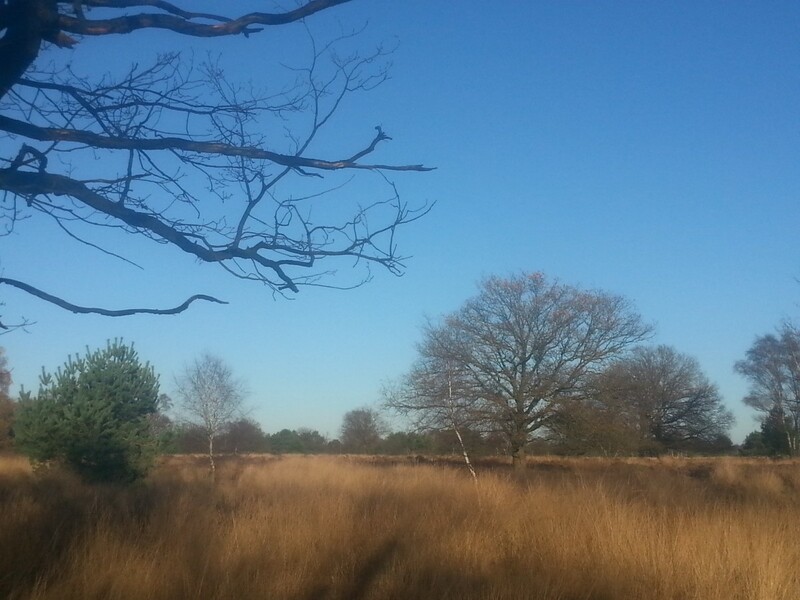 The moors of the “Kampina”, the area between Oisterwijk and Boxtel lie empty. There is a calm quiet, under a sharp winter sun. The constant hum of cars in the far distance only serves to be more aware of and deepen the silence. The heavy rains of the past couple of weeks have made large puddles and small lakes on the path. I can see the prints of walking boots, of horse’s hooves and mountain bike tires. Prints that show the absence of things that were and are no longer there. It makes me think of how you can sometimes see in someone’s face, under certain light or with a strong emotion, how they were as a child, with the energy and the dash of childhood. Just for a second it shows the child in the adult. Just for a second it shows you the source where the adult came from, then it is gone again. Sometimes it feels a bit painful, the sudden image of the source and how it has changed to today. It makes today feels like an absence, an emptiness that is not impersonal and quiet as the moors of winter. Today is an emptiness of human silence, an emptiness that needs to be filled with words and embraces. There is a group of children in the forest. A small boy in short trousers is playing in the sand. His attention is all with his play. He doesn’t look around him. He plays with twigs and sticks, writes lines in the sand. He is sitting there all by himself. There is an emptiness surrounding him, like a soap bubble, for those who can see. An emptiness full of silence and absence. Absence of words and embraces. That is his world. His friends are calling him, he hears them and slowly he walks towards them.